Designed with soft, comfortable fabrics that feel great on a baby's skin, the bouncer offers an adjustable harness with a soft restraint pad for added safety. The wide base is sturdy and features non-skid grips. The bouncer is certified by the juvenile products manufacturer's association (JPMA) for meeting all American society for testing and material (ASTM) standards. Lightweight, portable, and machine washable. The bouncer is lightweight and portable so you can easily move it from room to room. Plus, it's ideal to bring along to play dates or to grandma's house. The machine-washable seat pad is easy to remove for quick cleanup. Your little one will love to be lulled to sleep with the Ingenuity Moonlight Rocking Sleeper in Lullaby Lamb. Baby will be fascinated with the Soothing Star Shine projection that displays a soft starry light show. This innovative sleeper also features a mobile with 2 plush toys, a removable vibe unit for soothing vibrations and 8 melodies and 3 nature sounds. Gently rock and soothe baby in this smart and simple sleeper, with soft fabrics and a character shaped headrest that provides cushiony support. When baby isn't in dreamland, mom will love this ingenious lightweight frame for portability and storage. This will be your little lamb's favorite place to sleep. Designed specifically for baby's sensitive skin, the Deluxe Rainforest Friends Cradle 'n Swing features plush fabrics to keep your child cozy. Two-position recline and 3 adjustable seat positions to suit baby's mood. Deep and cozy Papsan style seat surrounds baby in comfort—with two swinging motions, soothing rainforest sights and sounds, and a variety of other customizable features that let you choose and combine what baby likes best! Plug-in option saves on batteries so baby can relax, swing and play in soothing comfort—all day! Soft and snuggly for soothing, with features to entertain, too! Fisher-Price Deluxe Rainforest Friends Cradle ‘n Swing cradles and swings...soothes and entertains...just the way baby likes it. How? By letting you choose and combine features baby likes best! Choose a swinging motion (side-to-side cradle or head-to-toe swing), a seat position (recline or upright; left-facing, center, or right-facing), and a swing speed (1-6)—then, if it suits baby’s mood, add 16 soothing tunes, gentle nature sounds and motion on the motorized mobile. Three soft friends “dance” overhead to soothe, entertain, and stimulate baby’s developing senses of sight and sound; mirrored globe lets baby see herself (and all around! ); linkable rainforest frog toy entertains, too! 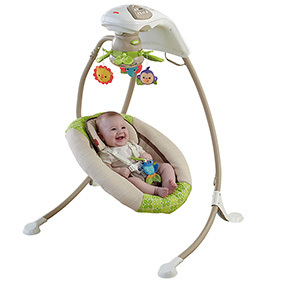 Fisher-Price Deluxe Rainforest Friends Cradle ‘n Swing features SmartSwing Technology, with a wide range of swinging speeds from low to high so you can find the perfect motion to soothe baby. It actually senses baby’s weight (so speeds won’t slow as baby grows)—and it starts without a push! It’s easy to assemble, with two convenient power options: use the included 120-volt AC adapter (so you save on batteries!) or 4 D batteries (when you’re not near an outlet to plug in). The sturdy steel frame has legs that fold, so it’s easy to store and move from room-to-room, too. Swing away—and see what develops! Fisher-Price Deluxe Rainforest Cradle ‘n Swing offers baby a sense of soothing comfort and security through two different swing motions and an ultra-plush, deep, and cozy Papasan style seat. Music, nature sounds, and a motorized mobile stimulate baby’s senses, with animal friends that encourage eye-tracking, a mirrored globe for self-discovery, and linkable frog toy that detaches for take-along. Part of the Fisher-Price Rainforest Friends Collection! Includes one Fisher-Price Deluxe Rainforest Friends Cradle ‘n Swing with 120-volt AC Adapter. Requires 4 D alkaline batteries, not included, for optional battery powered operation. Adult assembly required, Allen wrench (included) and Phillips screwdriver (not included) needed. SmartSwing Technology lets you adjust the swinging speed and direction for the most soothing experience for baby. Use from birth until child attempts to climb out of product. Max weight: 25 pounds. The My Little Snugapuppy Deluxe Newborn Rock n' Play Sleeper is a unique portable sleep seat for newborns, with a wonderful rocking action and secure inclined position for babies who need it and it now includes calming vibrations. It features a plush puppy head support and a plush body insert to comfort baby. The frame rocks gently with a push from mom. The sides have breathable fabrics, and it collapses easily to bring along on visits or trips. For entertaining, there are clackers on a link. Now even easier to clean. Get busy relaxing (and playing) with Baby's Bouncer! The seat gently bounces in response to baby's natural motions. A press of a button adds optional calming vibrations, too. When it's time to play, three animal friends on the toy bar encourage baby to reach and grasp (exercising developing motor skills), bat (encouraging development of eye-hand coordination), and play (which is just plain fun). Graco's Simple Sway proves that great things come in small packages. This smart swing has tons of features to help you soothe and comfort baby, all packed into a compact frame design. It's easy to keep baby close wherever you are at home. You'll have the option to power up with batteries or save money with the plug-in. The side-to-side swaying motion comforts your little one and 6 swing speeds let you match baby's mood. A mobile with 3 soft toys, 15 songs and sounds and a 5-point harness to keep baby secure round out the swing's terrific features. Graco's Soothing System Glider, in Abbington, has four modes, including a gliding swing, gliding bassinet, portable bouncer, and portable bassinet. In glider mode, it soothes with the same gentle motion used when cuddling and comforting baby in your nursery glider. Use the portable bassinet to keep baby close to you anywhere in the home or the portable bouncer to entertain your little one in any room. The plush, roomy seat with removable infant supports and vibration will keep baby cozy, while music will keep baby entertained. With the Graco Soothing System Glider, you have four modes of use with the gliding motion baby loves! From soothing sways, music and sounds to calming vibrations, light projection and more, this bassinet has everything to help little ones drift off to dreamland in comfort. As babies relax on the comfy sleeping pad, they can look up at the mesmerizing overhead mobile with stars while they gently sway. Or, turn on one of the captivating light features, like the overhead projection. You can also remove the projector from the bassinet and use it as a tabletop soother! And, there's a convenient night light setting for an added sense of security. For extra coziness, turn on the calming vibrations and serene songs or sounds. (Ahhh, that's nice...) Getting a good night's sleep sometimes can be a challenge, but it's super important for baby's brain development. With the Fisher-Price Soothing Motions Bassinet, you'll be ready to help your little one soothe and snooze night after night! (So comfy…so cozy…so Zzzzz…) Where development comes into play Sensory: A variety of soft textures, calming vibrations, and swaying motion stimulate baby's senses. Security & Happiness: Soft padding, calming vibrations, and gentle swaying help soothe baby and become part of the nap and bedtime routine, giving baby a sense of security. Additional features include deluxe overhead mobile, comfy, flat sleeping surface, optional lock-out to minimize swaying motion, mesh sides for breathability—making it easy to see the baby and ample storage space. Graco's Simple Sway proves that great things come in small packages. 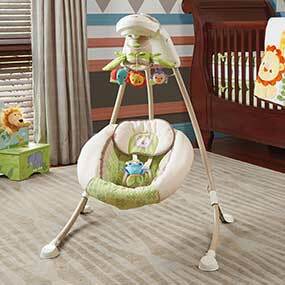 This smart swing has tons of features to help you soothe and comfort baby, all packed into a compact frame design. It's easy to keep baby close wherever you are at home! You'll have the option to power up with batteries or save money with the plug-in. The side-to-side swaying motion comforts your little one and 6 swing speeds let you match baby's mood. A mobile with 3 soft toys, 15 songs and sounds and a 5-point harness to keep baby secure round out the swing's terrific features. Bring baby from floor to couch level—and everywhere in between! We took the classic baby bouncer and gave it a much-needed lift! Designed to naturally integrate baby into family moments, the Uplift Multi-Level Baby Bouncer starts as a traditional floor bouncer and can be elevated to sofa height—or any level in between—with the turn of a knob. From the first family dinner to offering mom a quick moment to shower, the Uplift bouncer keeps baby in-sight, engaged and safely supported. With a neutral color palette and beautifully streamlined look to fit into any contemporary home, it features vibration, sounds, and a range of other baby-friendly benefits. - Auto-off feature after 20 mins. - For babies up to 25 lbs. - Do not use flat. - Do not carry with baby in seat. - Do not place on table or counter. - Do not raise or lower with baby in seat. 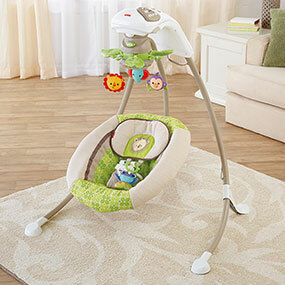 Your little one will love snuggling into the comfy, deep seat of the Fisher-Price Moonlight Meadow Deluxe Bouncer! With soothing vibrations and up to 20 minutes of music and nature sounds, baby will drift off to dreamland in no time! And when it’s time to wake up, baby can enjoy the plush toys on the removable toy bar. Soft, snuggly and oh-so-soothing—with two cradle ‘n swing motions and a variety of other customizable features that let you choose and combine what baby likes best! SmartSwing Technology offers 6 distinct swinging speeds from low to high so you can find the perfect rhythm and motion to help soothe baby—swinging side-to-side (like a cradle) or swinging head-to-toe. It’s easy to switch from one swing motion to another; just push a button and turn the seat! Fisher-Price Moonlight Meadow Cradle ‘n Swing actually senses baby’s weight (so speeds won’t slow as baby grows)—and it starts without a push. The motorized mobile helps soothe baby, too, with 16 songs, nature sounds and three soft animal friends that “dance” overhead to encourage eye-tracking and keep baby entertained. And the mirrored globe in the center of the mobile lets baby see all around the room! The deep, cozy seat with machine-washable padded seat cover has a linkable rattle toy, and a machine-washable body insert and head support for newborns and infants. It’s easy to assemble, with legs that fold for storage or portable room-to-room use. Two convenient power options make Cradle ‘n Swing easy to use anywhere around the house. Plug it in for battery-free baby swing operation when you’re near an outlet, or switch to battery power swinging when you’re not!